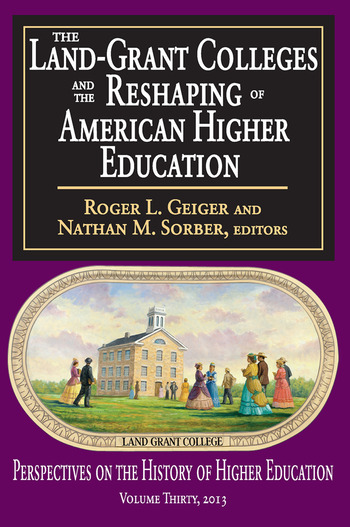 This work provides a critical reexamination of the origin and development of America's land-grant colleges and universities, created by the most important piece of legislation in higher education. The story is divided into five parts that provide closer examinations of representative developments. Part I describes the connection between agricultural research and American colleges. Part II shows that the responsibility of defining and implementing the land-grant act fell to the states, which produced a variety of institutions in the nineteenth century. Part III details the first phase of the conflict during the latter decades of the nineteenth century about whether land colleges were intended to be agricultural colleges, or full academic institutions. Part IV focuses on the fact that full-fledged universities became dominant institutions of American higher education. The final part shows that the land-grant mission is alive and well in university colleges of agriculture and, in fact, is inherent to their identity. Including some of the best minds the field has to offer, this volume follows in the fine tradition of past books in Transaction's Perspectives on the History of Higher Education series.